I held off on calling because I felt Emily had enough to deal with; an email would give her whatever space and time she might need. And her favorite jacket washed out clean. The best thing, by far, that I have ever read on the subject of Paula Deen is this essay, ending with an invitation to her to come cook and bake and break bread with the author. Powerful in his forgiving, his empathy, and in the opportunity he offers her. The point of my mentioning this is not Paula Deen: it is in the wisdom and the words of the wonderful human being that is Michael Twitty. Last October I loaned a friend a skirt for part of her Halloween costume. It was a tall size Talbots, silk, bought off Ebay for a buck plus shipping charges that were no more than a gallon of gas–it seemed worth the risk at the time, though the color was a guess from the poor photo; I could always change that part anyway. Vivid orangey red is the exact light frequency that sets off my head injury the most and tosses my flimsy balance away. Yow! But it was long, flattering. Elegant. Emily absolutely loved it. She’s tall, she loved the color, it fit her perfectly, for her it was perfect, and so when she came to bring it back I offered her to keep it. No no, it’s yours, and she refused, delighted by the gesture, though. As I mentioned yesterday, I was cleaning up in preparation for our houseguests. They’ll be here after seeing Yosemite–I don’t think my brother’s been in California since the summer I was 10 and he turned 12–and somehow I came across that forgotten skirt. And so I found myself looking at it yesterday morning and thinking of Emily. Well, I did already try to give it to her, time to finally go put it in that dyepot and darken the color. A lot. No sense in having it go unworn. The lining is polyester and will likely stay what it is and resist the protein-fibers-specific Jacquard bath, but that’s okay. Seems a shame to risk it, though–it’s harder to dye finished clothes evenly than it is yarn. But no sense in wasting it, either. I started to pick it up to start the pre-soak. Something felt so strongly, no, that, no, and I put it back down. Huh. I looked at it again and thought of her and how much she’d loved it, and at last left it spread out on the ironing board ready to steam press or dunk but doing nothing yet. I found myself thinking of her all day as I passed in and out of the laundry room with the neon-bright skirt front and center. The skirt was secondary; Emily seemed uppermost in my thoughts. There was an email that came in last night. Emily’s husband was out of town. She thought she smelled smoke. They think it was her water heater, but whatever it was it became a two-alarm fire that also damaged the apartment above her. She and her baby got out and nobody was hurt but she was evacuated from her home. Many, many friends responded to the mass email and helped her get her family’s belongings, what remained of them, into a storage container because I guess it all had to go. Now. Richard, who has done Red Cross volunteer work responding to house fires, says that typically it takes weeks for the fire officials to investigate causes of unknown origin–you don’t want the next apartment over doing the exact same thing shortly after, you want to find and verify and fix. And then there’s the wait for the repair work to be done before you can move back in. It can take months. I was absolutely wiped after cleaning out the yarn room, and with that recent Crohn’s growling, I did not dare push my body further in one day. But what I could do was to offer a beautiful, bright, cheery skirt that I knew would fit her body and soul, something new rising from the ashes. Don’t know if her computer burned… Haven’t heard back yet. Whether she lets me give it to her or not is almost beside the point. When she most needed support by her side, before her friends knew, the Love in the universe was right there for her trying to get through my thick head. Emily. Emily needs you. I interpreted it in a way that made sense to me at the time, but at least at the end of her terrible day she could know there was someone who’d been thinking of her constantly from about the time the whole thing started. And if in the fire she lost the scarf I knit her awhile ago then I will go find some fabulous, soft yarn and it will be in bright orangey red. Spent the day getting the yarn-and-projects room sorted and emptied and vacuumed and readied for houseguests, grateful for the energy to do so–I had several days of the Crohn’s threatening a comeback last week and it was such a relief to have a good day. I think we dodged that one. 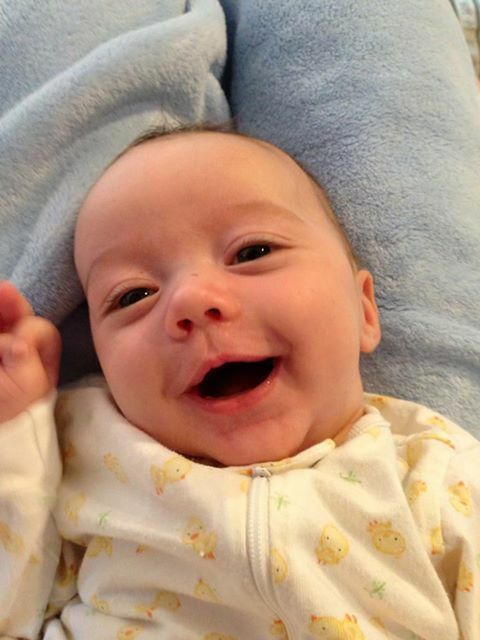 Meantime, there is nothing like a baby’s smile–or a two-year-old’s giggle, or a teenager reasoning things out, for that matter; every stage is the best stage. 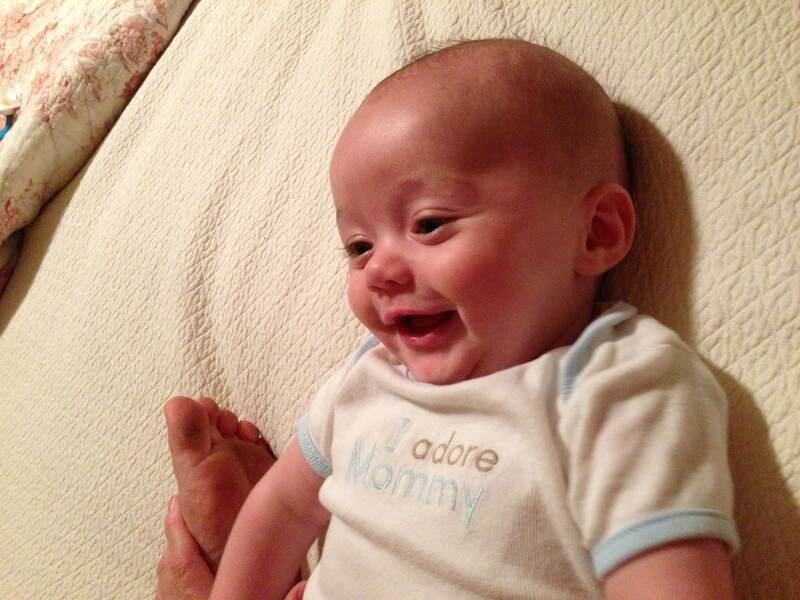 And yet–there’s just nothing quite like Hudson’s smile. I guess we’ll find out. We’ll be there Saturday with my brother and his family. Can’t wait! 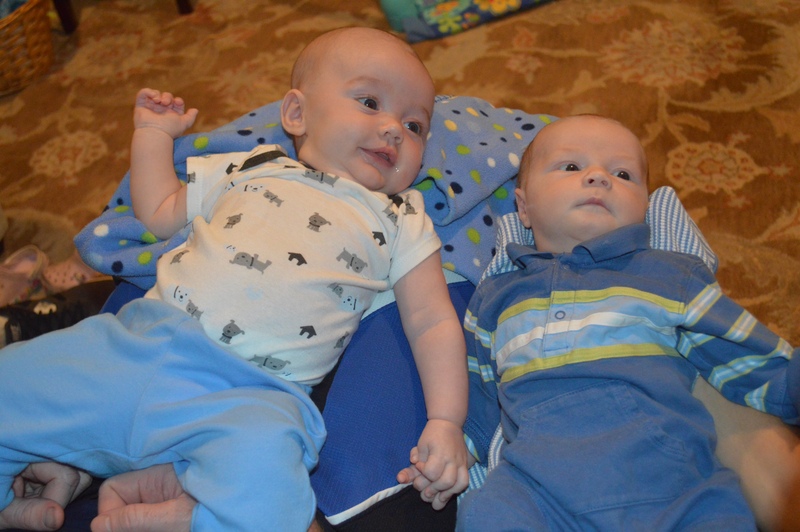 Hudson and his new cousin Hayes! (I finally got the photo to work–took me awhile.) Hayes looks a lot older to me than not quite two weeks. Those two little boys are going to have great fun growing up together–and I am so grateful they get to. “A friend is one that knows you as you are.” That sense of–something, and I looked up from the book and there was my own raptor in the deepening dusk. The word rouse? As in rouse yourself out of bed? It comes from what a bird, specifically a hawk does after it fluffs out its feathers when it relaxes: it then gives itself a good shake to bring them all back into place just so, ready for flight. He was perched silently on the fence, watching us watching him, taking in the evening. A finch flew to the twigs hanging by the feeder–then froze, as if that would make its presence less obvious. When the hawk’s feathers seemed to fluff out just a bit more, the little one made a break for it, knowing that that gave it as good a split-second advantage as it was going to get. A goldfinch a few minutes later. Same thing. Coopernicus had already eaten; he was just enjoying his people time. He roused himself at last. “The fated sky gives us free scope.” Tarried a little longer, and having made our day better, was off. I suddenly had a horde of squirrels a few minutes ago. The birds had eaten all the safflower, and the bit of sunflower at the bottom of the feeder for the goldfinches was not only exposed, it was all that was left and the bushytails called all their buddies to celebrate their find. Well heck I could use the exercise anyway. To teach them not to be the swaggering city rodents they were acting like, I opened the door (yeah lady? You and what dog? You can’t fool us, they’re gone now) and I chased the two that went in the same direction back to a tree. They yelled squirrelly expletives at me all the way up once they hit the safety of higher-than-me, still running (but they didn’t come back). Over all the years and all the previous hearing aids, I haven’t heard that sound since I was a kid. I instantly knew what it was, it seemed a perfectly ordinary thing, and then it hit me. It took a flying leap. I actually watched, in real time, a brown bear cub standing in a river, scanning constantly back and forth and finally catching a salmon at the base of a small waterfall. And then his mother, keeping a bit of a distance from him, snatched one out of the water too. I’m not sure why it should surprise me that there was a wildlife cam set up there, especially given that I used to help run one for the San Jose peregrine falcon nest, but it’s wonderful. Once they have that fish in their jaws they seem to consistently move to shore to eat, I imagine so that if their prey somehow slips or escapes, they can’t lose it. As soon as one was caught the number of gulls in the vicinity seemed to go up, maybe waiting to steal a bite from the picnic basket? And since it’s summer and they’re in Alaska, the daylight for watching them all by just goes on and on and on. Kathleen stopped by again today for some one-on-one time before they head further south tomorrow. We shared memories, explored each other’s takes on things political and found ourselves nodding in agreement over and over (always a nice thing), laughed loud enough to be heard into the next block. We moved into the kitchen for lunch and kept going for hours more. The birdfeeder was getting low before that point. It was quite empty and probably had been for awhile when we came out of there when Richard came home, and not to deprive her of any birdwatching time, I gave it a quick refill. We went from nothing in sight to here comes the flock–we weren’t the only ones ready for dinner. I’d scattered some suet, too, and pointed out the Bewick’s wren. At the very moment I found the Cooper’s page in my Sibley book to show her, with the two of us standing there and Richard sitting next to us, suddenly there were two bangs at the window and Coopernicus himself did a swoop around the amaryllises in chase. I missed the first part of it, my nose in that book, and then the windows reflecting off each other from my angle got in my way a moment more, but they said he strolled under the picnic table, looking for his prey. We held still, watching him and his struggling-then-still finch, and after a moment she reached for her camera. He gathered it close and took off; as I explained, he’s fine with being watched unless he has a meal in his talons and then he gets antsy. We might be trying to steal his prey, she affirmed. While I thought, She got to see him!! She got to see my hawk!! He’s a big bird, isn’t he? I asked. The other wonderful thing about today is that baby Hayes came home. The traces of chemical trauma were such that they said there was no indication nor expectation of longterm brain damage. And he’s a beautiful, wide-eyed baby boy, looking at the insides of a car and carseat for the first time in the picture they sent us. There’s a picture of her on the right, here, at my in-laws’ old house in Kensington, Maryland. Anyway: my childhood friend Kathleen and her husband and son are having the Great American Summer Adventure and have now driven clear to where the sun doesn’t rise at the ocean like suns normally do. Which is why we discovered that a tree root had lifted the side of the inner gate such that it no longer latches (never noticed that–that tree’s gone now, though) and we wanted to give their dogs a chance to run around in the back yard awhile. Gee, did we have any, like, string in the house we could, y’know, tie that thing together with for the moment? Housework in its mindlessness (I do after all have houseguests coming in a week) is a way to let ideas sift through for the creative side: okay, if we add to the seed stitch in blue here and change the cables here and here to go over, not under, it will look like water flowing around the pier near that park… And don’t forget to add stitches to make up for the tightness the cabling causes. But how much of that will be offset by the seed stitch? Okay, so add fewer than the typical third more. Right? I sat down to actually start making all this visualizing come to pass and found myself remembering how much my son Richard in particular, uncle to the baby getting this blankie, liked to fit things into things. A hole where a plastic screw was missing on his Smurf ride-on toy? Bobby pins fit into it nicely. So did straws, twisties, our missing pens, anything he could get in there. We took up the air vent covers all over the old house before we moved and retrieved some of our missing silverware. Don’t let that kid near the dashboard again–we don’t know where he found the coins but we eventually found out what he did with them while I was buckling his new sister in first. Gave new meaning to the term baby rattle. And I thought of Bashie’s story and the penny in her dad’s back. Yeah, I think a little one would have fun figuring out how to get a coin wedged into the curves of the cables. Kathy and Rachel are neighbors to each other and Purlescence buddies to me; Kathy had an errand to run this morning, and so she came by here with yarn, a quick gab-and-g0. Mostly Cascade 220 superwash, mostly from Rachel, some from her, pick and choose and use what suits and have fun. The happiest kind of peer pressure. Not that I needed any to launch right into it. To Hayes with love from the whole wide world, welcoming him to safe harbors. So here’s what I know now: Hayes went 15 minutes without breathing when he was born. I knew he’d been given transfusions and oxygen. They did take him off the cooling blanket Thursday and gradually warmed him up, so the fact that the MRI on Saturday was normal was everything they could have hoped for in terms of worrying about brain damage–it’s a miracle. It’s just a miracle. He will stay in the hospital a number of days yet to establish his breathing as the effects of the morphine on a newborn’s metabolism gradually wear off. I so cannot wait to see my grandsons playing with their new cousin. To life! I almost deleted most of yesterday’s post. I came thisclose. I didn’t want to make the yarn anybody else’s problem nor even to remotely seem like I might think it should be. I have very generous friends. Thank you, Kathy, thank you, Rachel, and everybody else who got beaten to the punch. I offered Rachel to swap her some silk for her blue Cascade, sure that that basil green in my stash would be just the color on her, or maybe the brick red, and she half-waved me off telling me she knew I needed to give back but it certainly wasn’t necessary. So we’re still working out schedules to get together. Oh, and the photo? 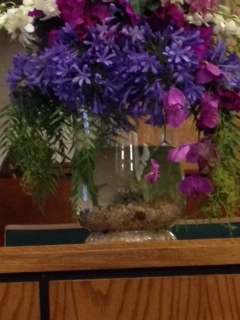 Someone brought this flower arrangement to church last week. One young man got up to give his talk and as he started, he couldn’t help but turn back to it and he marveled to his audience, wanting to share his close-up view, There are *fish* in that vase! Okay, I’m slow–it wasn’t till I typed that just now, a week later, that I realized, oh, wait, it IS a Christian church, and as a visual poem that’s pretty cool. The best part was the little children who came up after the meeting to see the fish swimming quietly under the flowers where you would never expect to see such a thing. I’m drawing a blank. ie. While I wondered what yarn I had in my stash that was baby boyish enough, babyproof-ish enough, and natural-fiberish enough to keep me happy too; Hudson’s newborn cousin Hayes now has a name. As far as I know, he’s still at so far so good. Knitting is another form of praying. A hat would show I love him (as if there were any question) but right now, given Parker’s rapture at his blankie homecoming on the day of Hayes’ birth, my heart’s set on a blankie for him too after all that little guy has had to go through in his first week. Budget vs good intentions. Reality vs perfectionism. Not to mention the new flooring we’re saving for. Maybe coordinating sock yarns paired together? But there’s no loft in that, not the same thing for smushing your face into with glee like Parker did. Anyone have any experience with machine washing and drying baby alpaca repeatedly? I finally got to go to Purlescence‘s knit night, the second time since May due to germs and travel and other friends’ schedules. I walked in and felt like, oh, I’m home! I had heard about the Halos of Hope program to knit chemo caps for cancer patients (finally googled it just now; I recognize the logo, that’s the place); those running it donate all their time so that there is zero overhead involved, only the mailing of the caps. They sell patterns for them to try to meet those mailing expenses themselves as much as they can. Benjamin Levisay had mentioned it on Facebook. But I’d thought, well that’s nice but why don’t I just knit one and drop it off at the clinic’s hematology department next time I go in and save them the postage? They do actually have a collection table for such and I’ve thought for awhile that I should. So I asked Nathania. I knew Purlescence had gone in in a big way, with a 24-hour Halos of Hope knitathon last weekend. (I missed it. Richard had a bad 24-hour bug and I sure didn’t want to contribute that to the gathering.) Two hundred and ten hats! And that’s when I learned that Halos is aimed at those in medically underserved communities and where yarn money is hard to come by; here, there are a lot of knitters and crocheters, there’s a lot of people who are financially quite comfortable and it’s not difficult for the needs to be met: something beautiful, something artistic, something made with love and talent and skill and compassion and a good-deed outlet for one’s leisure time. I mentioned I had an online friend who has to drive two hours to get to the nearest doctor, and she nodded, Exactly. No no, come, let everybody see what you did! And so her fifty-four hats got put in the center of the group for everyone to see and the woman got the applause and cheers that she wasn’t looking for but so much deserved. She had earned her halo. I remember how hesitant my mother-in-law was to ask me to knit her a chemo cap, and how deeply gratifying it was to be able to say, Of course I will! And then another and another, let’s see, Mom’s favorite colors, and another and another, I tried to make her a full wardrobe of chemo caps. Tonight made me stop and envision what it must be like to have–none. Wow. 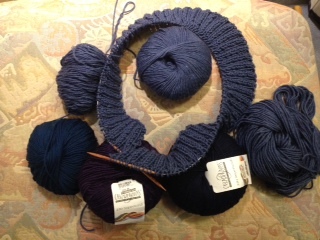 Soft yarn, small purse project, coming up. We stumbled across a newsletter from Stanford this evening that we hadn’t thrown away because it had an article Richard had wanted to read on a new-improved type of cataract surgery. We did a doubletake when he happened to pick it up: this meant we still had, now that we wanted it, the article neither of us had noticed on a treatment they’d pioneered for full-term babies born with oxygen deprivation, including their trial over a dozen years ago of a cooling process to keep swelling in the brain and seizures from setting in during the most dangerous early period, to calm down metabolic processes that would do damage; it is now the accepted standard. And that’s what they’re doing with my daughter-in-law’s sister’s Baby P. But the cold is painful for him so he’s been on a morphine drip. Still, he’s active despite the morphine and he got through the first 24 hours without a seizure and that is very good. And we are very, very grateful for all the prayers and the Thinking Good Thoughts and the support. Thank you all. Normally, our son explained, when the cord is wrapped around the neck and causing problems, the heart rate drops during delivery and they’re right on it. In Baby P’s case, everything appeared normal, heartbeat peachy fine, until he was out: but not only was the cord wrapped, it was kinked, and there was no way to know how long it had been affecting him. He stopped breathing two minutes after he was born and he had a hole in his lungs. He was supposed to have the breathing tube removed today and that hole is supposed to have healed by now, as we wait on updates; babies are amazing little troopers. He will be in the NICU for a number of days being monitored and the next big risk is when they let him warm up again. But his sisters have been allowed to come in and meet their new brother and welcome him into their family. And a year from now he’ll be giggling with and bugging Hudson by grabbing him to try to pull up and walk just like Hudson, just like Parker’s cousin four months younger did with him two years ago. Hang in there, little buddy.